Several months before my Aunt passed away, she gave me a Bible. I knew it was something I would treasure…I did not know that I would consider it part of a legacy that she handed down to me……until I began to truly seek wisdom in raising my children. You see, she gave me this sweet Precious Moments Family-Time Bible…and I love it. It has been used quite often in our home for devotions and discussions with children…helping them see how much God loves them, their value to him…and opportunities in growing their character to be more like Christ. Recently, this sweet Bible changed a little. Tabs and highlights were added. Because I was blessed to receive the Child Training Bible program. The Child Training Bible program is a fabulous way to help you, as a parent gain knowledge in God’s word to grow your character, as well as your child/children’s character! The owners of the Child Training Bible have identified 21 various Character Traits/topic that can (and should be) be addressed by God’s word. You begin by placing the Key inside the front cover of your Bible (on the first thick page in your Bible). You then utilize the Easy Tabbers to find, highlight (I used twistable crayons) and tab (the page) of the scripture that pertains to each character trait/topic. Once your Bible is set up with the scriptures highlighted and pages tabbed, you need to store your 3 Easy Tabbers. You do not want to tape these onto a page because you will need them for the scripture that pertains to the character traits/topics on the key. They are provided on one side of each tabber and on the other side you have questions and prayers to provide you with more guidance, as a parent wanting your child to open their heart to our Heavenly Father. My daughter and I found a way to store tabbers in our Bible….that will help keep them handy, but not destroy any portion of them. We took a piece of construction paper, folded the sides and bottom. This created a pocket to store the 3 easy tabbers in the back by attaching the ‘pocket’ into the back cover of our bible. 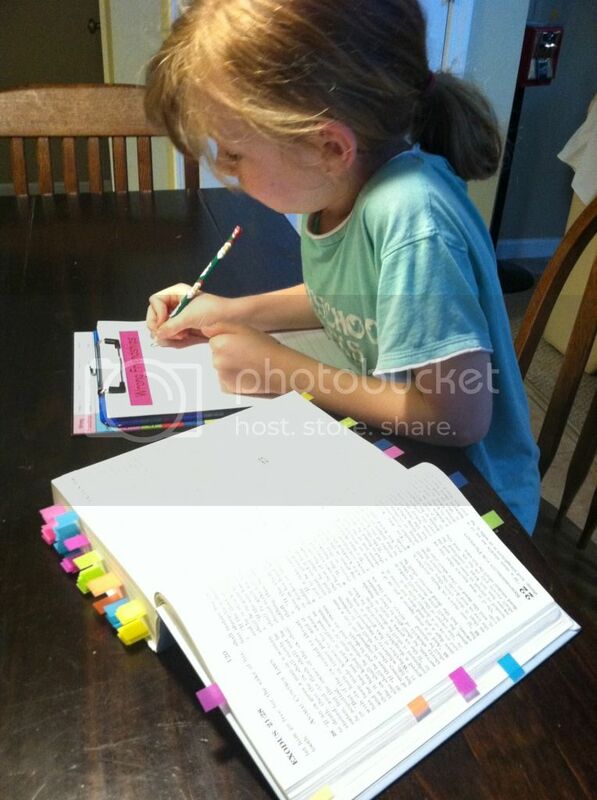 This is a picture of our daughter working on her copywork/scripture memorization using the Child Training Bible and some simple notebooking pages I have created for our home to compliment this system. (Please note, the notebooking pagesare available for you to use. 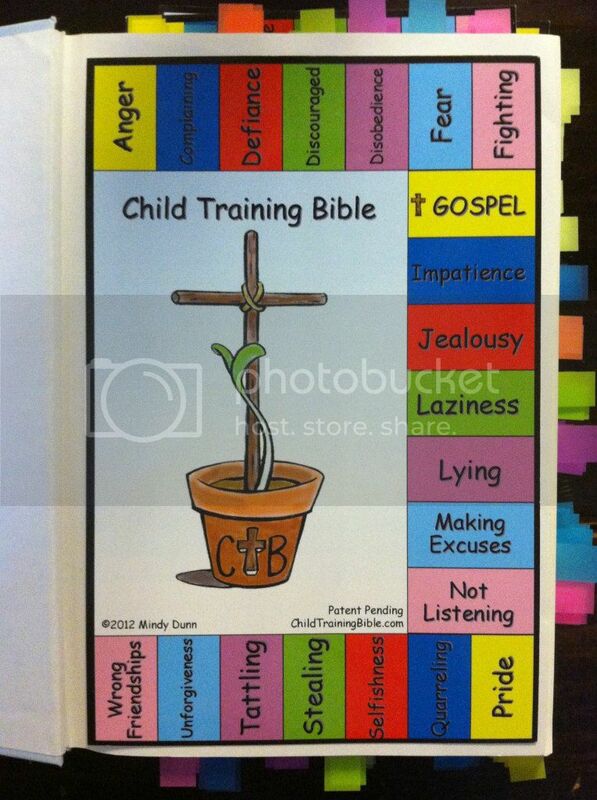 I have contacted the owners of the Child Training Bible and they have approved me sharing these sheets with you. These simple pages identify the character traits/topics and appropriate color codes for each, but I have not provided the scripture associated with them). I believe this would be an added value to any home desiring to share God’s word and help bring about heart change. This would also make a GREAT gift for new parents. 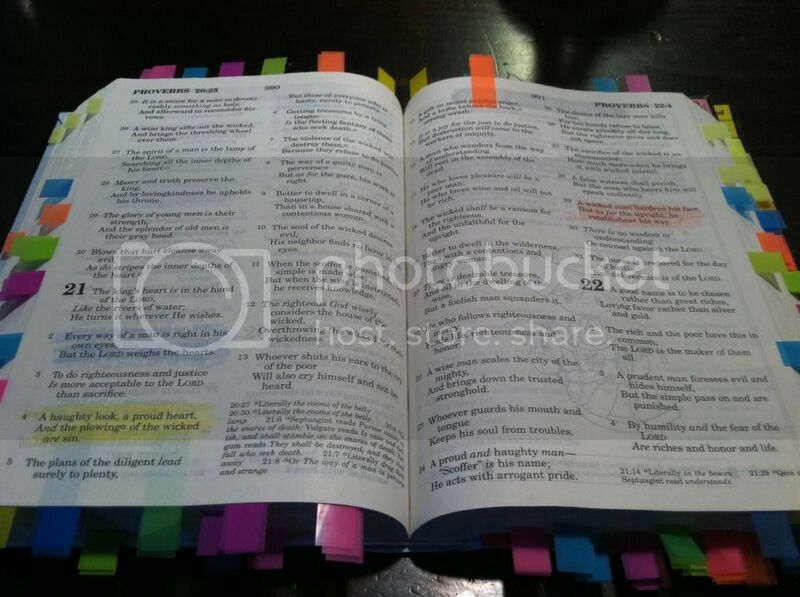 While the tabbing and highlighting take some time (it took me a little more than 3 hours), it is my opinion that if you give this as a gift, perhaps add a Bible, but do not tab/highlight for someone else. Going through the scriptures, helps you gain insight to enable a parent to immediately implement the program. The Child Training Bible is available on the Child Training Bible Website for $9. Disclosure: I received a free Child Training Bible in exchange for my honest opinion. No other compensation was received. « Patrick Henry: Give Me Liberty or Give me Death! I would really love to win this… Been looking at it on several blogs!! LOVE THIS IDEA! I’ve been trying to win it all over the internet, lol. I know it’s only $9 and I could have it, but I don’t really have an extra $9 at the moment and just really wanna win. Thanks for the opportunity! I would LOVE to win one of these…what a great way to teach my son! I hope to win for my daughter. She just went through a tough divorce and her son is almost 3yrs old. (my first grandchild). I think she can use all the help she can on raising him. And as a grandmother I would like this Bible to be his first. I would love to win this!!! Thank you for this great giveaway! I would love to have this for my girls ages 3 and 6. They have entered a stage of difficulty in their relationship- fighting, dealing with selfishness, etc. and I would love to have for guidance! I keep seeing this bible popping up and now I’m really interested! It would be perfect for our family! Thanks for hosting this giveaway Rebecca! We got one of these at 2:1 last weekend. I’m excited to put one together and review it. I set ours up as soon as I got home from 2:1 and I LOVE it. The concept is just perfect, simple, but full of truth! Thank you for these journal pages- what a great idea! I would love to win this for my precious toddlers! I’d love to win this! What a wonderful idea! What a great training tool! Would love to win one. Than you so much for sharing this!! It maybe just what the Lord lead me to see today!! 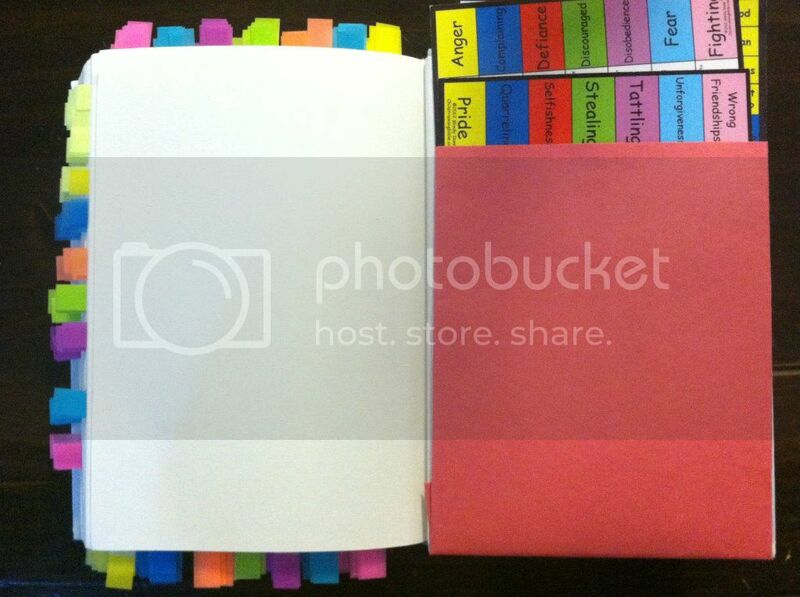 I happened upon your site and love these notebook pages! Thank you so much for sharing. I intended on buying the Child Training Bible and these are wonderful. One question, do you use them to have your child write down the scriptures? Thank you so much for the notebooking page PDF. I really appreciate it!